Picnic At Marina: "The Best Tuna Salad..."
In 2001, when I just moved from New York to Seattle, I was desperate for any job, and when the opportunity to work in the renovated food court of University of Washington came, I was on board the very next week. I was a prep cook before we would open, and then I served the food to a thousands of hungry students in exchange of their cash. If you ask me which part I liked better, I couldn't tell you as both experiences were joyful. I loved watching our chefs at work (there was an Italian section called At Home, where all meals were prepared from scratch every morning), from whom I've learned some tips and tricks around the kitchen, including my knife skills. I also loved the atmosphere during serving time: cheerful, bright, and smart. Few years later, when my language skills improved and I got all my educational papers translated and in order, I left the HUB (that's how we called our food court) to pursue my career goal at other job. But the sentimental feeling of my years in the crazy yet delicious and fascinating student environment never left me. On our huge spice/herb rack I found a jar with rarely used dry dill. It took me a second to think of my tuna salad. I felt like a kid who just found a jar of candies: my eyes were shiny, my face was stamped with a big happy smile. The basic recipe for tuna salad had just a few ingredients: tuna, celery, pickles, red onions, black pepper, and mayonnaise. I added dry dill, and reduced amount of mayo (to me the salad didn't look pretty, swimming in all that mayo). Customers loved it, and it came to the point when I had to double the amount of salad for the day. That's when the Chef came in with the recipe check. Oh, no! Busted! I was standing in the corner, head down, making myself as invisible as possible. Zillion excuses run through my head before he started to talk to me. He was standing there, smiling: "Let me try the best tuna salad everyone is talking about", he said. What? Did I hear it right, "the best tuna salad"? "Everyone is talking about"? I knew it was popular because we sold more and more of it, but the best?! and to hear it from the Chef? I was so proud, I was so happy! it was my little victory and one of the best awards. I told the chef what I did to the original recipe. He approved it with a smile. Then he asked me if I want to learn how to make pastry, but for this I would have to come to work two hours earlier in the morning. Who could refuse such offer? Not me... The very next morning I came to work two hours earlier, to make pastry, then to continue later with my tuna salad. In large bowl combine all ingredients, and you don't have to measure exactly (can of tuna, 2-3 pickles), taste to adjust seasoning. Refrigerate for 1-2 hours and eat! This does sound like the best tuna salad, Marina! I'll have to make some soon. Working with the students at UW is truly marvelous! The HUB is being remodeled and will re-open soon with a new food court. You'll have to check it out the next time you are in Seattle. Hope you are enjoying summer! And I have clicked to read your guest post on "fear of writing" and I am so surprised and sooo proud of you. You are so brave to go to a new county in which you cannot communicate well, then learn the language and actually start a blog in English. I can imagine that despite all those wonderful experiences you must have felt stuck sometimes as a journalist doing some petty jobs. Well at least I feel this way quite often being trained as a biotechnologist and environmental scientist and working as a personal assistant. Thank you Joanna, for your kind comment. Yes, looking back I am thinking that if someone told me what I had to go through, I would laugh in disbelieve. But sometimes we do what we have to do, and what doesn't kill us makes us stronger. I am patiently waiting for the recipe then. And I have to admit that my kitchen life is sometimes ruled by the fact that I have to take photos of dishes I cook in the proper lightning and proper weather. Pros and cons of being a food blogger that wants to have nice photos hihihi. What a lovely story! Can't wait to try the recipe. I haven't had a good tuna salad in a while now. Thank you for the inspiration. Working with students is very rewarding. They so appreciate the things you do for them. Your tuna salad looks and sounds delicious! It's always nice to be complimented by the head chef....you are making me miss my culinary career a wee bit. :) I know, I miss it too, and quite often. I think I miss the atmosphere too. Wonderful story...i enjoyed reading it! Now that tuna salad is amazingly delicious looking but I love those cheese muffins..so tempting! Can't wait to see how you make your cheese muffins. I'll be back! I did not know that English was not you native language. You write beautifully! Thank you for sharing BOTH stories! Your tuna salad recipe looks delicious. I look forward to seeing your cheese muffins recipe coming soon. I love tuna with dill, great stories! Marina, first of all thanks for commenting on my noodle salad. It hardly seems fair because your tuna salad is miles better and it seems, more popular than mine! And I've only read this one post, but already I am SO inspired by your story, and by you! I'm going to come back here again to check on those two other recipes. You are always welcome here, in my kitchen! :) Please, do come back! pickles go fabulously with tuna! Love this. Marina, I just love reading your heartfelt stories...this one, especially! Looks like you have one scoop of tuna salad, and the other two are the salmon salads, since you mentioned your ran out of tuna, then proceeded to make the salmon...very delicious, craving it right now, and will be buying canned salmon! Have not used canned salmon in decades...seriously, since probably the late seventies! Love the pickled watermelon rinds...anything pickled is my faves! 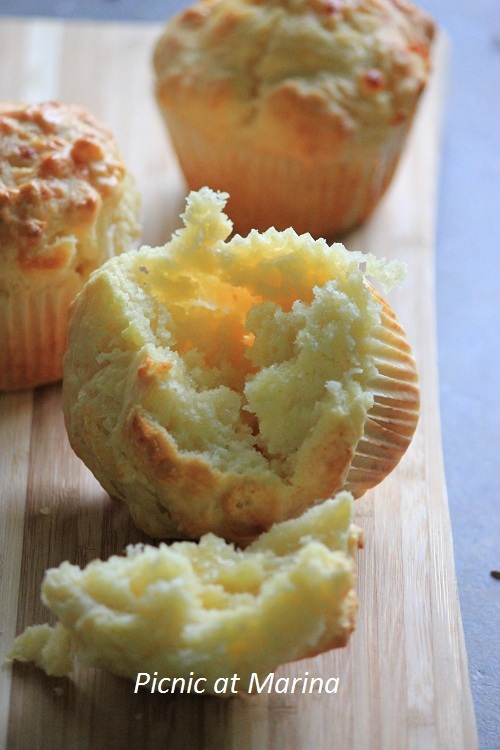 The muffins look so scrumptious, and moist...will click back to get recipe! Elisabeth, that's actually all salmon, I didn't have any tuna in my house, so I just used the same recipe with salmon. It worked very well, we had it all for lunch with no leftover (I always think that I would have some leftover for later to indulge!). I am sure that when you are thinking of those days back then you also think of how many things you have accomplished. As a very important poet of my country Kavafis said "All I have done is not little, where I am now, great glory!" Your story was so interesting to read and your tuna salad is bookmarked! Yes, add some dill (I found dry dill more fragrant), I hope you like it! I like tuna salad and dill goes so well with seafood. It sounds like a perfect match and since it is famous how could I not try it. Thank you Karen! :) I think chef said it to make me feel better... And it did! 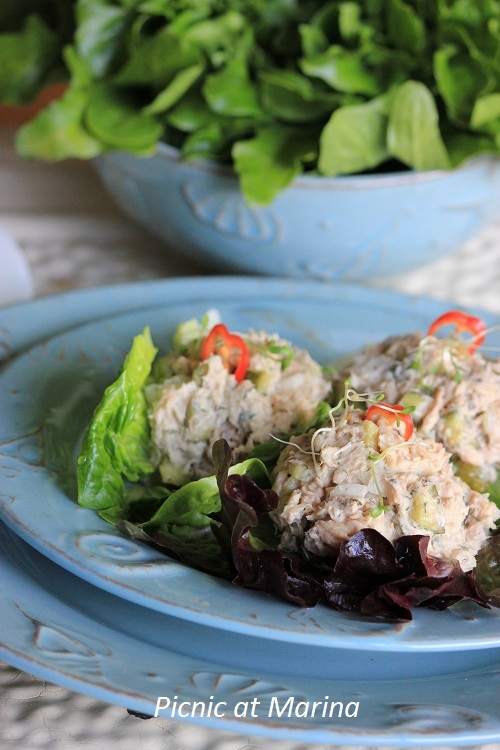 Tuna salad is a classic one and great for lunch on any day of the week. Yours looks excellent. Thank you Alida! Are you still in Italy? The dry dill sounds like a good ingredient to add. We had tuna sandwiches at lunch today. I'll try making it with salmon next time! Great idea! Diane, I go through so mush dry dill that I have to buy it in bulk! It is delicious herb, I think! :) Thanks for visiting me here! I'm going to have to try dried dill again. I had kind of written it off, although that was so long ago I've forgotten why (I'll bet what I used was too old). Anyway, nice tuna salad! I like mine with onion (I know) and celery, but yours looks delish. Really fun story - thanks for sharing. Great story, Marina! And that Tuna Salad looks awesome, congratulations! Wow, that is quite an amazing story. I am sure you must have felt so good. I am going to give your recipe a shot. I love tuna salad especially in a sandwich. 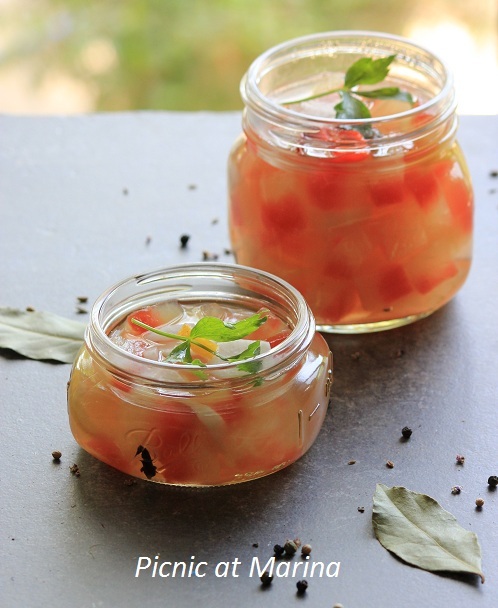 And there I was wondering about watermelon rind pickle and I can see a tantalising photo.... :) What a lovely blog you have! I would say, wonderful pictures! The way you presented this tuna salad, made me even more hungry!! Bookmarked. I love dill so much - they use it a lot in Sweden (sometimes too much... they seem to put it in all their potato salads!!!) but it's delicious though. Come to think about it, I don't think I've ever seen it dried, but it's good to know that the flavours get more concentrated as it dries. Some herbs don't take well to being dried at all (chives and parsley? lol!). Lovely sounding salad, I bet the dill is a wonderfully tasty touch! Wow your post opened my eyes - I've never made salmon salad instead of tuna! My kids probably prefer salmon over tuna (they eat tuna too) so I will give it a try. Adding dry dill in the tuna salad is fabulous and I look forward to trying it. Great stories with delicious recipe!